Celestial marriage (also called the New and Everlasting Covenant of Marriage, Eternal Marriage, Temple Marriage or The Principle) is a doctrine of Mormonism, particularly The Church of Jesus Christ of Latter-day Saints (LDS Church) and branches of Mormon fundamentalism. 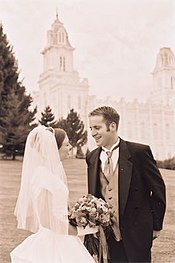 Within the LDS Church, celestial marriage is an ordinance associated with a covenant that takes place inside temples by those authorized to hold the sealing power. The only people allowed to enter the temple, be married there, or attend these weddings are those who hold an official temple recommend. Obtaining a temple recommend requires one to abide by LDS Church doctrine and be interviewed and considered worthy by their bishop and stake president. A prerequisite to contracting a celestial marriage, in addition to obtaining a temple recommend, involves undergoing the temple endowment, which involves making of certain covenants with God. In particular, one is expected to promise to be obedient to all the Lord's commandments including living a clean chaste life, abstaining oneself from any impure thing, willing to sacrifice and consecrate all that one has for the Lord. In the marriage ceremony a man and a woman make covenants to God and to each other and are said to be sealed as husband and wife for time and all eternity. Mormonism, citing Matthew 16:19 and Matthew 18:18, distinguishes itself on this point from some other religious traditions by emphasizing that marriage relationships and covenants made in this life in the temple will continue to be valid in the next life if they abide by these covenants. In the 19th century, the term "celestial marriage" usually referred to the practice of plural marriage, a practice which the LDS Church formally abandoned in 1890. The term is still used in this sense by Mormon fundamentalists not affiliated with the LDS Church. In the LDS Church today, both men and women may enter a celestial marriage with only one living partner at a time. A man may be sealed to more than one woman. If his wife dies, he may enter another celestial marriage, and be sealed to both his living wife and deceased wife or wives. Many Mormons believe that all these marriages will be valid in the eternities and the husband will live together in the celestial kingdom as a family with all to whom he was sealed. In 1998, the LDS Church changed the policy and now also allows women to be sealed to more than one man. A woman, however, may not be sealed to more than one man at a time while she is alive. She may only be sealed to subsequent partners after she has died. Proxy sealings, like proxy baptisms, are merely offered to the person in the afterlife. According to church teachings, the celestial marriage covenant, as with other covenants, requires the continued righteousness of the couple to remain in effect after this life. If only one remains righteous that person is promised a righteous eternal companion in eternity. In Matthew 22:28-30, Jesus is asked about the continuing state of marriage after death and he affirms that at the resurrection "people will neither marry nor be given in marriage; they will be like the angels in heaven." Mormons do not interpret Jesus' statement as meaning "that marriages will not exist after the Resurrection, but that marriages will not be performed after the Resurrection; for all questions of marital status must be settled before that time." Thus, Mormons believe that only mortals can be the subject of an eternal marriage ordinance; mortals may receive the ordinance for themselves or by proxy for those who have already died. Celestial marriage is an instance of the LDS Church doctrine of sealing. Following a celestial marriage, not only are the couple sealed as husband and wife, but children born into the marriage are also sealed to that family. In cases where the husband and wife have been previously married civilly and there are already children from their union, the children accompany their parents to the temple and are sealed to their parents following the marriage ceremony. Mormons believe that through this sealing, man, wife and children will live together forever, if obedient to God's commandments. There is substantial doctrinal dispute between the LDS Church and its offshoots as to whether celestial marriage is plural or monogamous. Sealings for "time and eternity" (i.e., celestial marriages) were being performed for monogamous couples long before 1890. Throughout all time periods of the LDS Church's history, the great majority of temple sealings were between one man and one wife. [I]t is borne in mind that at this time the new law of marriage for the Church—marriage for eternity, including plurality of wives under some circumstances—was being introduced by the Prophet [Joseph Smith], it is very likely that the following article was written with a view of applying the principles here expounded to the conditions created by introducing said marriage system. He knew the voice of God—he knew the commandment of the Almighty to him was to go forward—to set the example, and establish Celestial plural marriage. He knew that he had not only his own prejudices and pre-possessions to combat and to overcome, but those of the whole Christian world...; but God ... had given the commandment. Nevertheless, it is correct that "celestial marriage" was often used to refer to plural marriage. Mormon fundamentalists cleave to the view that there is no celestial marriage that is not plural, while the LDS Church claims otherwise. As viewed by the LDS Church, plural marriages in the early church, when properly authorized and conducted, were, in fact, celestial marriages; but celestial marriages need not be plural marriages. In addition, since celestial marriages must be performed by someone with proper priesthood authority, and since plural marriage is no longer authorized by the LDS Church, no authorized celestial plural marriages can be performed today. Mormon fundamentalists argue, in return, that they have retained the priesthood authority to perform these marriages. A concept of celestial marriage was described by Emanuel Swedenborg as early as 1749. Swedenborg's Latin term conjugium coeleste was translated as "celestial marriage" by John Clowes in 1782. Two more recent translators have preferred the term "heavenly marriage." In all his authoritative writing, Swedenborg only mentions the term celestial marriage twice. Swedenborg defined the celestial marriage or heavenly marriage as the marriage of love with wisdom or of goodness with truth. He wrote, "Truth and good joined together is what is called the celestial marriage, which constitutes heaven itself with a person." Swedenborg does not use "celestial marriage" to refer to the marriage of husband and wife, although he says that the marriage of husband and wife has its origin in the heavenly or celestial marriage of goodness and truth. According to Swedenborg, true married love forms an eternal bond, an actual joining together of minds, so that married partners who truly love each other are not separated by death but continue to be married to eternity. He writes that this love is "celestial, spiritual, holy pure and clean above every love which exists from the Lord with angels of heaven and people in the church." None can come into this love, he says, but those who are monogamous and "who go to the Lord and love the truths of the church and do the good things it teaches." Craig Miller has investigated the possibility that Swedenborg influenced Joseph Smith, as there are similarities between some of their teachings. He concludes that Smith may have learned something about Swedenborg through third parties, but was unlikely to have read much if any of Swedenborg's works for himself. Among Smith's connections was Sarah Cleveland, who was married to a Swedenborgian at the time of her plural marriage to Smith in 1842. [self-published source?] It was shortly afterwards, in July 1843, that Smith recorded receiving a revelation regarding eternal marriage in Doctrine and Covenants 132. ^ Jay M. Todd, "Information For Brides and Grooms Planning a Temple Marriage", New Era, June 1971. ^ LDS Church, "Chapter 7: Matthew 19–23", New Testament Student Manual (Salt Lake City, Utah: LDS Church, 2014). ^ "The Manifesto and the End of Plural Marriage". lds.org. The Church of Jesus Christ of Latter-day Saints. Retrieved 28 March 2019. ^ Arcana Coelestia, John Elliot, trans., (London: Swedenborg Society, 1983), §162. ^ Secrets of Heaven, (Arcana Coelestia), Lisa Hyatt Cooper, trans., (West Chester, Pennsylvania: Swedenborg Foundation, 2008), §162. ^ Swedenborg, Arcana Coelestia §10300. ^ Swedenborg, Heaven and Hell §§366-386, Conjugial Love §§27, 45. ^ Swedenborg, Conjugial Love §180. ^ Swedenborg, Conjugial Love §70. ^ Craig Miller, "Did Emanuel Swedenborg Influence LDS Doctrine?" Buerger, David John (2002), The Mysteries of Godliness: A History of Mormon Temple Worship (2nd ed. ), Salt Lake City: Signature Books, ISBN 1-56085-176-7 . Cannon, George Q. (October 9, 1869), "Celestial Marriage", Journal of Discourses by President Brigham Young his two Counsellors, and the Twelve Apostles, 13, Liverpool: Horace S. Eldredge, pp. 197–209 . McConkie, Bruce R (1966), "Plural Marriage", Mormon Doctrine (1st ed. ), Salt Lake City: Bookcraft, p. 578 . Pratt, Orson (1853), "Celestial Marriage", The Seer (1-12 ed. ), Washington D.C.: Orson Pratt, 1 . A multi-part series of articles in which Orson Pratt describes his view of the relationship between celestial marriage and polygamy in the 1800s. Complete series in PDF available here (26MB). This work was never accepted as official doctrine of The Church of Jesus Christ of Latter-day Saints. Pratt, Orson (October 7, 1869), "Celestial Marriage", Journal of Discourses by President Brigham Young his two Counsellors, and the Twelve Apostles, 13, Liverpool: Horace S. Eldredge, pp. 183–196 . Roberts, B. H., ed. (1909), History of the Church of Jesus Christ of Latter-day Saints, 5, Salt Lake City: Deseret News . Smith, George A. (October 8, 1869), "Celestial Marriage—Bishops and Deacons Should be Married—Divorce", Journal of Discourses by President Brigham Young his two Counsellors, and the Twelve Apostles, 13, Liverpool: Horace S. Eldredge, pp. 37–42 .